Hope everyone has a fun weekend planned!! This morning the design team has more inspiration for how you can use the dies and stamps in Becca Feeken 's November Amazing Paper Graces Kit Club. First here is a look at the third project you will be able to make with your kit. Becca cleverly placed four corners together to create this stunning square lace doily. Here is the view of the inside of Becca's card from this month's kit. Debbie Olson created this sweet stitched card using Becca's Filigree Corner Dies for more details visit Debbie's blog post. Sharon Harnist designed this sweet November Calendar with Becca's stamps and dies from her November Kit. Heidi Blankenship designed a beautiful wedding card with a sweet charm -visit her blog for all the details. Kazan Clark designed this elegant 3-D Filigree Christmas Tree which would be beautiful Christmas Ornament or tablesetting decor for Christmas Dinner. Angela Barkhouse designed the first page for her daughter's wedding album and used the filigree corners to frame her scrapbook page. Becca's November Amazing Paper Grace Kit is simply Gorgeous! 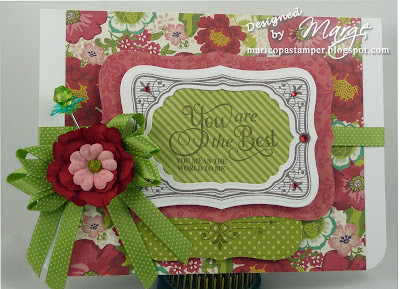 You are going to love this month's dies – an Elegant Set of Filigree Corner Dies. Perfect for embellishing this sweet Shadow Box Calendar, which is one of the 3 projects in this month's kit. Becca's A New Day Stamp Set is perfect for making calendar based gifts for the holiday season. In November Kit you will also get everything to make the outside of this card. and the inside of the card with this beautiful sentiment framed with Becca's Small Filigree Corner Accents. Here is a look at the gorgeous die! Here are all the projects in this Month's Kit. The design team had a ton of fun playing with the stamps and dies in the November Kit. Marisa Job made this gorgeous wall hanging combining Becca's October Die with one of the sentiments in the A New Day Stamp Set. She used the November Kits Filigree Corners to frame For all the details visit Marisa's blog post. Michele Kovack used the filigree corner die to create a sweet skirt for her dress form. for all the details visit Michele's blog post. Barb Schram - always thinks outside of the box and today she was so clever to use the filigree corner die to create a Fanciful Christmas Tree card. Here is a look at the inside of her card. Eva Dobilas die cut the elegant filigree corner dies in black to create a frame for her sentiment. Stop back in tomorrow to see what the rest of the design team created with Becca's November Kit stamps and dies. This month you can buy just the November Kit, a Silver (6 month membership) or a Gold (12 month membership). Please be advised that next month we anticipate that we may only have a few single month kits left after we fill the orders for our monthly subscribers. Amazing Paper Graces Kits are not available for purchase on the JustRite Site to purchase any of the last three kits click here to shop. Congratulations to all our JustRite Friday Challenge Winners! You can see the JustRite pinterest board for this challenge with all the Friday Challenge entries here. This week's winners were decided by Kellie, Amy, Marisa, and Angela. Thank you for all your prayers and donations for Darsie. Darsie found a new place to live yesterday and is so relieved that she will soon be in a new home. Many of you have mentioned that you would like to send Darsie crafting supplies or cards. If you would like to send Darsie something please contact Angela Barkhouse at agbark@roadrunner.com and she will send you Darsie's new address. I prefer not to post Darsie's new address on the web. Thank you for all your love and support. Today we are introducing the last two set in our October Release – Friends Antique Labels One and Embroidered Background Stamp. You will just adore the projects the design team created with these sets- They are Fresh fun and gorgeous color combinations! Friends Antique Labels One is designed to coordinate with JustRite Custom Dies Antique Labels One Dies and Antique Tags One Dies. Marisa Job designed a stunning card using Friends Antique Labels One, Embroidered Background Stamp, Classic Embroidered Edges Two, Antique Labels One Dies and Classic Edges One Dies. For the flowers and leaves, she used Rose Creations and Foliage Two by Spellbinders. 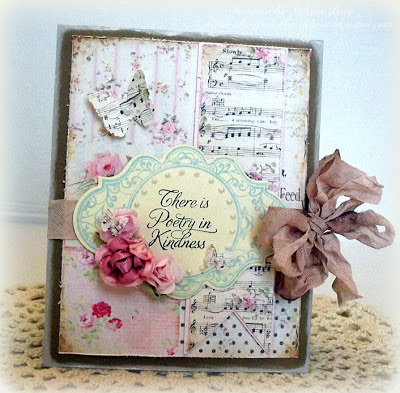 Eva Dobilas designed a Fresh & Fun friendship card using Friends Antique Labels One, Embroidered Background Stamp, Classic Sentiment Edges One, and the following dies Antique Labels One Dies, Classic Edges One Dies to create this exquisite card. Debbie Olson stamped the Embroidered Background Stamp tone on tone to create this fun friendship card in line green and pink. Debbie used Friends Antique Labels One, Lace Medallion Labels to create her card die cut with Antique Labels One Dies, Nested Oval Medallion Labels Die, Antique Tags One Dies. Here is the full view of her pencil box. Michele Kovack also designed this beautiful freindship card using Friends Antique Labels One, Embroidered Background Stamp die cut with Antique Labels One Dies and accented with Spellbinders Foliage Two, leaves. Kazan Clark created this fun shaped card using Friends Antique Labels One Embroidered Background Stamp die cut with Antique Tags One Dies. Heidi Blankenship used a striking color combo of red, black and yellow to create her freindship card using Friends Antique Labels One and Antique Labels One Dies adorend with forget me not flowers from this month's cross marketing partner Petaloo. Join us the week of Oct 22nd – 26th to see projects designed by the JustRite Design Team and the Petaloo Design team.